It is very easy to build your own sauna when you buy our "Standard" Series DIY sauna kit. You receive a complete sauna materials package - custom planned for the right materials, the right lengths of cedar and great instructions - no running around to find specialty sauna parts. Even a first time do it yourself sauna builder can make a beautiful cedar home sauna with our "Standard" Series DIY home sauna kit. Sometimes called a "Pre Cut" sauna kit. Our "Standard" Sauna Kits match kits our competitors sell at much higher prices! Up to $600 Max Discount - Get Factory Prices! Call us for a quote - take advantage of our low factory prices! Our "Standard" sauna kit is similar to the kits sold by competitors - like them we use thinner cedar to reduce the price - then we beat their price! Over 35 parts are included: heater, door, benches, etc. Our "Standard" Series DIY sauna kit is made of clear grade Western Red Cedar - the ideal sauna wood. The tongue-&-groove thickness of the 1x4 is 1/2"+ (it is quite thin for saunas - but we match the competition). Our "Standard" Series sauna kit is for the price-conscious sauna builder who wants a great-looking sauna for minimal cost. You supply the insulated stud walls - our kit has 35 parts for the inside of the sauna. Customizing is easy - we have been customizing saunas since 1974. Sauna Heater - included - a standard series sauna heater with control, heater may have a painted black frame. Tongue & Groove Cedar - included - premium grade of clear 1x4 cedar, full-length boards, that have been dried to 9% moisture content. The thickness is only 1/2"+, a common thickness used by many sauna suppliers to lower the price. Inside height is a standard 82". Benches - included - two-tier benches along the longest wall use 1x4 for the bench tops in clear grade cedar. The upgrade to strong 2x4 for the bench tops is highly recommended. Aluminum Foil - included - the heat-resistant sauna foil vapor barrier. Light Fixture - included - 1 vapor-proof marine light. Flooring - optional - cedar duckboards to cover the open part of the floor are available. Hardware - included - galvanized screws, galvanized nails, etc. Instructions - included - the best instructions for your project are based on the book, The Art Sauna Building. We're here to make this easy for you. No other supplier gives you this guidance. Bonus - included - our best-seller sauna book, The Art of Sauna Building. Over 65,000 saunas have been built by our customers using our book as a guide. 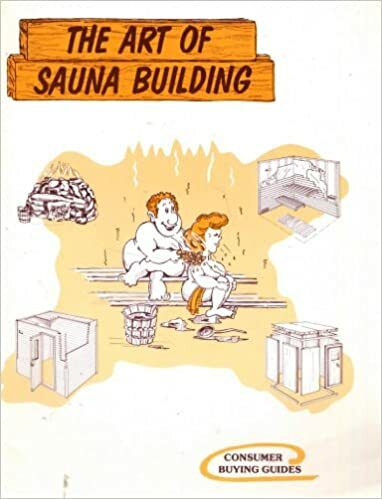 Now acclaimed as "the best sauna building book ever" by industry experts, it is well-illustrated with 164 drawings and step-by-step instructions. This is an exclusive feature our sauna factory provides. SUPPORT - our "Sauna-Guru Team" of trained sauna builders will support you on every step you take. The lowest prices are guaranteed - we will price match any one! Our Most Economical Sauna Kit! Canadian Customers - See CAD Prices! Save up to $600 - Order Today! 11. Upgrade to: Thickest T&G Cedar 11/16"
21. Upgrade Entire Kit to: "The Best" Kit, All Inclusive. Our floor plans include 2 benches along the longest wall. our best quality, best value. It's our most popular sauna kit. Our "Standard" Sauna Kits are "similar" to our competitors - but our prices are lower! Ordering the "Standard" Kit allows you to keep the price low. Select the main options only. Bench tops were made of thinner 1x3 or 1x4 cedar not 2x4. Benches include 2-tier benches, the upper bench is 18" or 20" wide. Optional Upgrade Add 3rd Bench - add 3rd bench (L-bench) if room, add $140. U.S. Customers - NO TAXES apply when shipped to U.S. destinations. Payable in USD Dollars. Sauna Kit Prices - The sauna kit prices include all the sauna parts and the sauna heater as described above. Packaging and crating are extra to eliminate shipping damage. Shipping Charges - Are extra. Our shipping charges are very reasonable because of our volume. Just email us your zip code for a shipping quote to your door. Canadian Customers - See Standard Sauna Kits - in Canada. HST or GST is charged on all sauna shipments to Canadian destinations. To Contact Us - Email Us.